Rattlesnake oil, grenades – we're talking bottles, people! Rare vintage bottles – mostly from the second half of the 19th century and very early 20th century – have become quite the hot genre of collectible in recent times. What was once a pastime reserved for a select few devotees who mainly sold and traded amongst themselves has turned into a category so mainstream that auctions dedicated just to bottles have become commonplace. That will be the case on Saturday, August 6th, when Holabird Western Americana (based in Reno, Nevada) hosts the annual auction of the Federation of Historical Bottle Collectors. The event, being held at the Lion's Gate Hotel in Sacramento, California (plus online, through several platforms), will feature 191 lots of bottles, nearly all of them rare Western examples. 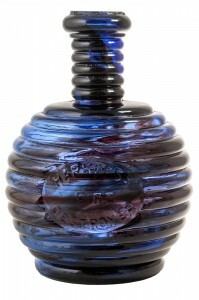 These will include 60 whiskeys, 50 sodas, 45 medicines, five bitters and ten “other”, to include a Harkness “Fire Destroyer” grenade bottle (shown, so-named for its shape, deep cobalt blue in color) and a rare drug bottle containing Worner's Rattlesnake Oil (Phoenix, Arizona, circa 1905, probably from the Territorial period). For more information, please visit on www.fhwac.com. 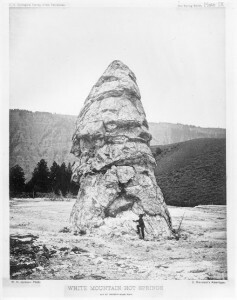 An important album of Albertypes from photographs by William Henry Jackson, containing the first photographic views of what would later become Yellowstone National Park, will be sold at auction by PBA Galleries in San Francisco on October 20th. The bound volume of 76 proof images, produced in 1874, was made from Jackson's glass plate negatives using the Albertype process, a then-new German technique to reproduce photographs. Only a handful of the albums survived (many were destroyed by a fire), and none are as complete as the copy being sold. The album was only recently discovered, just last summer, by collector Robert Enteen. That sent shockwaves through the tight-knit community of photographic scholars and collectors, as the first views of the wonders of the Yellowstone came to light. Since then, the album has been on exhibit at the Buffalo Bill Center of the West in Cody, Wyoming, where it will remain until the middle of this August. Jackson took hundreds of photos, of the towering mountains, breathtaking canyons, bubbling hot springs and the steamy geysers, all while traveling by mule. As the US gets ready for the first woman to be pictured on its paper currency in at least a century, Heritage Auctions would like to remind everybody that women have played an integral role in our money for more than 60 years. Fifteen women's signatures have appeared on every piece of paper money in that time, as the position of US Treasurer has been held by a woman. Their signatures were added to all issued currency. Many of those bills will be featured at Heritage Auctions' American Numismatic Association Currency Auction, August 10-15 in Dallas, Texas. Take the Serial No. 1 Presentation set pictured here, bestowed upon US Treasurer Kathleen Davalos Ortega in 1988 by President Ronald Reagan (Ortega served under both Presidents Reagan and George H.W. Bush). 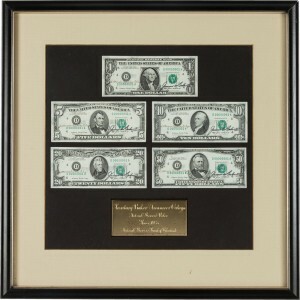 The set is a unique grouping that can't be duplicated: it's a presentation piece gifted by the Federal Reserve Bank of Cleveland, with a complete denomination set of serial number 1 Series 1985 Federal Reserve Notes from that District ($1, $5, $10, $20 and $50). The set is expected to sell for at least $50,000. For more information, please visit www.HA.com. Original artwork by New Orleans and other regional Louisiana painters is so sought after and valuable, it seems at least a half-dozen or more pieces are featured in Crescent City Auction Gallery's better estate sales. 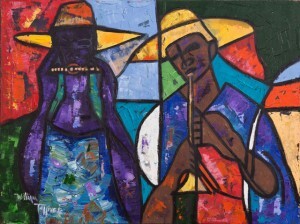 Case in point: the two-day weekend event planned for July 30th and 31st will feature this oil on canvas rendering by William Tolliver (1951-2000), titled African Musician (shown, est. $6,000-$9,000); as well as a 1970 oil on board by “the black Grandma Moses,” Clementine Hunter (1886-1987), titled Zinnias in a Yellow Pitcher (est. $2,500-$3,500). Additional works will feature an oil on board by Clarence Millet (1897-1959), titled French Quarter Patio (est. $6,000-$9,000); a 1975 oil on canvas by Don Wright (1938-2007), titled Sunrise in the Swamp (est. $1,500-$2,500); a 1975 oil on canvas by Jack R. Meyers (1930-1994), titled Washday at the Sharecropper's Cabin (est. $2,500-$3,500); a 1970 oil on board by Rhoda Stokes (1902-1988), titled Two Cows to Milk (est. $1,000-$2,000); and a pastel by Henry Casselli (b. 1946), titled Ballet Dancer (est. $3,000-$5,000). Visit www.crescentcityauctiongallery.com. The third annual Brooklyn Antiquarian Book Fair will be held Sept. 9-11 at the Brooklyn Expo Center, located at 79 Franklin Street in Greenport, Brooklyn (one of the five boroughs that comprise New York City). Nearly 100 top-tier dealers from all over the world will present collectible and antique books and quality ephemera. Ephemera are items made from paper that were not meant to stand the test of time, but have since become collectible. Examples of ephemera include correspondence, advertising, historical documents, posters, tickets, brochures, cards and more. The celebration will also feature many special events and exhibits designed to reflect Brooklyn's distinctive personality, quirkiness and central role in American literary history. 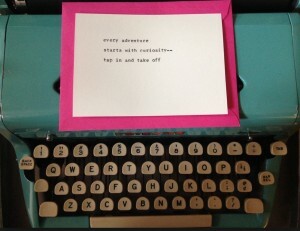 These will include an immersive poetic hideaway called The Haiku Lounge; a lovingly curated exhibit of vintage snapshots with literary themes presented by Stacy Waldman from House of Mirth; a book signing by Rebecca Rego Barry, author of Rare Books Uncovered: True Stories of Fantastic Finds in Unlikely Places; and a family Make-a-Book Workshop. Visit www.bookandpaperfairs.com.